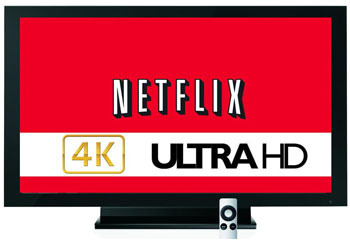 4K Ultra HD TV prices keep dropping, while 4K resources continue to increase. 4K movie and TV shows are abundantly available now - Ultra HD Blu-ray disc library jumps to nearly 300 titles, and Netflix library offers over 1,700 hours of 4K content, including a huge list of 4K movies from Hollywood. 2018 FIFA World Cup matches are also set to be broadcast in 4K HDR. Welcome to the 4K era. It's time to update to 4K if you haven't. Already got a 4K TV? Here's where to go to watch, stream or download content in 4K Ultra HD on your Ultra HD devices. Use the 4K UHD video downloader - MacX Video Converter Pro to enrich your 4K resources for offline playback, which allows you to download 4K 2160p Ultra HD movies, TV shows, game footages, video clips, live sports events etc. from YouTube, Dailymotion, Facebook, 1000+ video sites. It can also upscale SD/1080p to 4K for 4K TVs and downscale 4K to HD for smaller file size. Netflix is one of the largest 4K Ultra HD (HDR) content providers. The big giant offers nearly 120 4K titles and the number is increasing, covering movie, TV series, documentary, and stand-up special. Here's a full list of 4K titles on Netflix you can stream. Note that Ultra HD movies and TV shows are not available to users who choose Basic ($7.99) and Standard($10.99) plan. A 4K TV that supports 60fps, and a 4K compatible device connected via HDMI to UHD TV's port. HDMI cable and HDMI port on TV must be HDCP 2.2 certified. 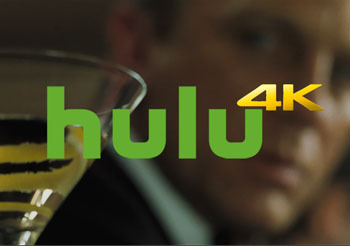 Hulu announced to support streaming movies & TV shows in 4K UHD in late 2016. Hulu doesn't have a lot of 4K titles or a 4K title list. 4K Ultra HD content on Hulu include Hulu original series Shut Eye, Chance, Star Trek Beyond, The Patch and 20 Bond movies. Internet connection with minimum download speed of 13Mbps. 4K UHD devices - Xbox One S and later, PlayStation 4 Pro. 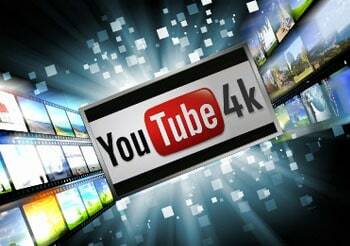 YouTube is the most popular 4K video streaming sites, providing a host of 4K HDR gaming videos, clips, movies, trailers, and TV shows. Compared to Netflix, YouTube has less 4K Ultra HD films and TV series, but it's definitely a great place to go to stream 4K clips, with quite a few 4K channels like the HDR channel, 4K relaxation channel and 4K demo channel. Plus, with a video processing tool, we can easily download 4K content from YouTube in a click for offline playback, sharing, or editing. Internet download speed of at least 25Mbps. A 4K device that supports the VP9 codec. 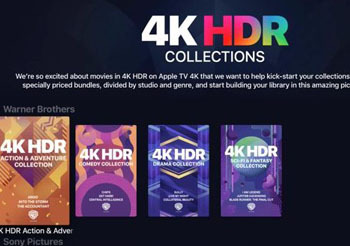 Massive 4K HDR content arrived at iTunes Store before the launch of the Apple TV 4K. We can find about 280 4K HDR & Dolby Vision movie and TV shows from Warner Brothers, Sony Pictures, 20th Century Fox, Universal Studios etc. on iTunes. Users can stream 2160p Ultra HD movie but are not allowed to download 4K UHD version and HDR & Dolby Version version. There are nearly 240 titles in 4K UHD on Amazon Video, including movies, TV series, documentaries, footages etc. On the Prime Video home screen, find Ultra HD category and browse 4K UHD titles to rent or buy. 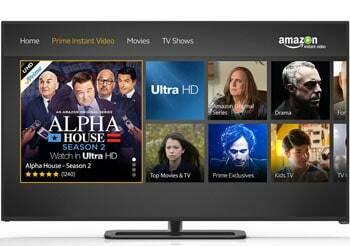 4K titles on Amazon Video now start at $ 5, and new releases are ranging from $7 to $19. For users who are looking for 4K Ultra HD content to watch, 4K Blu-ray disk is worth trying. The image quality offered by 4K Blu-ray discs is even better than 4K streaming from Netflix and other streaming services and very close to the cinematic experience. In addition, many new and current movies are available in 4K Blu-ray disks without waiting for a long time. Plenty of 4K Blu-ray disks are released in 2018, for example, blockbusters Justice League, Wonder, Jurassic World, The Shape of Water, Fifty Shades Freed, Transformers, and more. 4K Blu-ray disks start at $20, which is cheaper than streaming. Playback requirement: 4K Blu-ray player, 4K TV with HDCP 2.2 and HDMI 2.0 port. DISH has a large number of live and on-demand programs in 4K Ultra HD and over 540 4K channels for DISH Network 4K customers. It offers access to an increasing library of content in Ultra HD, including BBC's documentary Planet Earth, Game of Thrones, Outlander, sports event 2018 Olympics, Big Ten Basketball Tournament. DISH is also integrated with Netflix, YouTube, Hulu etc. streaming apps that have massive resources in 4K. Requirement: a 4K TV, DISH DVR (Hopper 3 is required to transmit live 4K HDR content to TV). DirectTV is also a great 4K Ultra HD content provider. It has up to three 4K UHD channels - Channel 104 featuring nature documentaries original series, and films, Channel 106 live events, Channel 105 Pay Per View movies. You can freely watch the sports event in 4K HDR like 2018 Olympics, National Basketball Association, English Premier League Soccer, Hollywood blockbusters Dunkirk, Wonder Woman, Suicide Squad, Mad Max: Fury Road, to name a few. Genie® HD DVR (Model HR54 or newer). A 4K compatible TV connected to 4K Genie Mini, and DIRECTV Select package. 4K dramatically enhances the gaming experience. There are two console models with 4K and HDR supported - Xbox One X and PlayStation 4 Pro. Gamers can download 4K game content Xbox One, Xbox One S and PlayStation 4 Pro. A vast of 4K game titles are available now, Doom, Anthem, Agents of Mayhem, Destiny 2, Dead Rising 4, the list goes on. To download 4K gaming content on Xbox One S or Xbox One, press the Xbox button, go to Settings > System > Backup & transfer and choose Download 4K game content, and then copy them to external storage after the download process is finished. Enrich Your 4K UHD Content Library Now! Get a 4K resource downloader now to enjoy more 4K videos offline without limits! MacX Video Converter Pro is worth trying. It can batch download 4K Ultra HD videos, clips, movies, TV shows, sports events from YouTube, Facebook, Vimeo, 1000+ sites. Upconvert HD to 4K UHD 2160p or downscale 4K to HD 1080p. The true 4K Ultra HD video players for smooth 4K playback. How to downscale 4K to 1080p without much quality loss. Here's a list of most popular 4K UHD video editors.